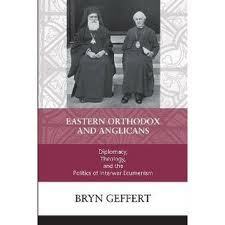 Review of Bryn Geffert, Eastern Orthodox and Anglicans: Diplomacy, Theology, and the Politics of Interwar Ecumenism (Notre Dame, IN: University of Notre Dame Press, 2010), 501 pp. ISBN-13: 978-0-268-02975-3. Sixty years ago, when I was a student at Cambridge, I attended meetings of the exotically named Fellowship of St Alban and St Sergius. This organization, founded in the 1920s, was established to promote better relations between Anglicans and the Orthodox Churches of Eastern Europe. We were given a chance to meet heavily-bearded Russian clerics (in exile) or gaudily dressed Greek bishops. There was much talk about the desirability of church reunion. This was meat and drink for us members of the Student Christian Movement whose discipleship was largely based on promoting Christian unity through such bodies as the World Council of Churches. And the foreign visitors, despite their limited English, seemed glad to meet young, eager, but ecumenically naive students at Britain’s top university. But despite the high-flown rhetoric and the elaborate rituals, not much was achieved. Bryn Geffert’s excellently researched and invigoratingly written survey of these relations during the twentieth century explains why. Or rather, why not. After the disasters of the First World War, the leadership of the Anglican Church recognized the need for spiritual rebirth. They were well aware of the damage done to Christian credibility because of the churches’ divisions. The Anglo-Catholic wing tried hard to patch over the long-standing quarrels with Rome but met only stinging rebuffs. So the Orthodox Churches looked to be more promising. In 1925 the sixteen hundredth anniversary of the Nicene Creed afforded the occasion to invite a high-ranking delegation of Orthodox clergy to come to England, where they were rapturously received. They were taken to Windsor Castle and Lambeth Palace. They met the Lord Mayor of London, and were feted at garden parties. The absence of theological discussions – and thus of theological disagreements – gave free rein to optimism about church reunion. They very much hoped that their example would draw other branches of the Christian world into the bosom of ecumenical unity. There was a great deal of wishful thinking. For their part the Orthodox Churches, both in the Russian and Greek branches, desperately needed assistance. The 1917 Revolution had devastated the Russian Orthodox Church. Its patriarch was a prisoner of the Communists. Thousands of its priests, nuns and monks had been murdered. Its property had been confiscated. And its very survival, apart from the few clergy who had managed to escape, seemed problematical. Many of these now homeless exiles looked to the British government for both political and social relief. In Constantinople, the new Turkish government was waging a war against its Greek citizens, and expelling them en masse. Only the intervention of the British government saved the Ecumenical Patriarchate from being expelled too. Feuds amongst the Orthodox in the Middle East only added to their distress. All were in great need. Reunion, or at least closer relations with sympathetic Christian communities, offered some rays of hope. The English response was warm-hearted and generous. The horrors of the Soviet repression evoked much sympathy. The new Patriarch in Constantinople, Meletios, seemed to be more open to Western ideas for reform. And in Jerusalem, the Orthodox Patriarch openly appealed to the newly-established British Mandate in Palestine to help him overcome his financial difficulties now that the flood of Russian pilgrims was no longer coming. Funds were raised through the Clergy and Church Aid Fund to assist the exiled communities and to sponsor a theological college in Paris. Cooperation with the YMCA and the World Student Christian Federation, which helped to promote many of the exiles’ publications, showed their strong commitment to ecumenism. But despite all this, large segments of the Church of England remained ignorant and apathetic towards Orthodox theology or any talk of reunion. Protestant Anglicans, especially the more mission-oriented Evangelicals, were openly hostile. And when discussions turned to more substantial theological issues, the gap between the rhetoric and the reality was soon clear enough. The Orthodox leaders were themselves divided on the doctrinal questions. They had had four centuries to ask whether the Church of England was a true church, or a heretical body. Were Anglican orders valid or not? The conservatives on the whole thought the latter. They saw Westminster Abbey and St Paul’s Cathedral as strongholds of modernism and westernization, both of which were perceived as a threat to Orthodox integrity. Furthermore there were bitter disputes and heated rivalries for supremacy among the different Orthodox groups, which prevented any united, let alone ecumenical, approach. On the other side, relations were not improved by the split in the Church of England over a new Prayer Book, which in fact was turned down by a vote in Parliament in 1927. Its defeat disillusioned many Orthodox friends and raised once again doubts about Anglican heterodoxy. Thereafter relations drifted. It became clear that agreement on such broad questions as the nature of the Church or a common confession of faith was a pipe dream. Compromise solutions seemed vague and ambivalent, and were rejected by both sides. Church reunion was no nearer. Geffert’s masterly dissection of these matters deserves close attention, showing all too clearly the thorn-filled path towards Christian unity.